Vertical axis with bearings in stuffing box designed to allow the lower part of the shaft to work overhang without mountings submerged into the liquid. Bodies are in cast iron, divided in two halves with protective lining made in Dragflow’s special anti-wear moulded rubber, composed of interchangeable shells adjustable from outside. The impeller is anti-clogging, open type composed of a steel core lined with special anti-abrasive compound. Direct coupling through elastic joint in two pieces. 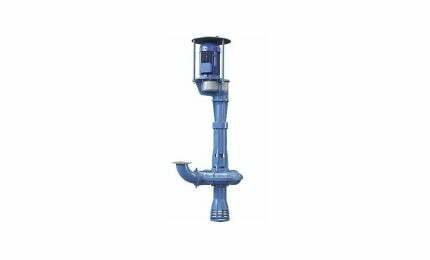 Vertical cantilever pumps designed and studied for the conveying abrasive slurries and tailings. Vertical axis with bearings in stuffing box are designed to allow the lower part of the shaft to work overhang without mountings submerged into the liquid. Bodies are in cast iron, divided in two halves with protective lining made in Dragflow’s special anti-wear moulded rubber, composed of interchangeable shells adjustable from outside. The impeller is anti-clogging, open type composed of a steel core lined with special, anti-abrasive compound. They have coupling through pulleys and trapezoidal belts, for countries with frequency Hz.60. Special pumps designed and developed for the conveying of particularly abrasive thick muds with specific gravity up to 2.5t/m³. Suitable, above all, for emptying decantation tanks and conveying the thick muds to tanks / pits for processing. This type of pump does not have the snore piece as the mud / slurry to be pumped falls into the pump body. Vertical axis with bearings in stuffing box designed to allow the lower part of the shaft to work overhang without mountings submerged into the liquid. The bodies are in spheroidal cast iron with upwards suction mouth as to allow the income of particularly thick muds to the impeller. The impeller is with channels in spheroidal cast iron. Special impeller design and low mud speed assure long-life to pump wear parts.